Since 2001, the Human Origins Program has collaborated with the Chinese Academy of Sciences to study the oldest clues to the spread of human ancestors to East Asia. This work has re-calculated the age of excavated discoveries by earlier teams, particularly in the extraordinary fossil beds of the Nihewan basin of northern China (Hebei Province) and the Yuanmou site in southern China (Yunnan Province). In both regions, our team has re-examined the early hominin evidence and has undertaken geological reanalysis of the excavation sites. The geological work entails micro-sampling of the sediments to determine the finest scale changes in the magnetic properties of the sediments, which can be tied to the sequence of well-dated shifts in Earth’s magnetic field. The last of the major shifts occurred around 790,000 to 780,000 years ago (known as the Brunhes-Matuyama boundary), and the detailed sampling by the Chinese team has even captured minor shifts in the magnetic field. The Nihewan research includes new excavations, which have led so far to the recovery of the oldest known stone tools in northern China, in a series of layers dating from approximately 1.66 to 1.32 million years old. The Yuanmou stone tools and fossil incisor teeth are from a layer dated around 1.7 million years ago. These ages are based on the calculation of rates of sediment deposition between the known magnetic transitions in the Nihewan and Yuanmou strata. Ages can be determined because calculations of deposition rate in different parts of the sequence are all highly consistent; this implies that the age of the fossils and artifacts within the sediments can be reliably estimated. 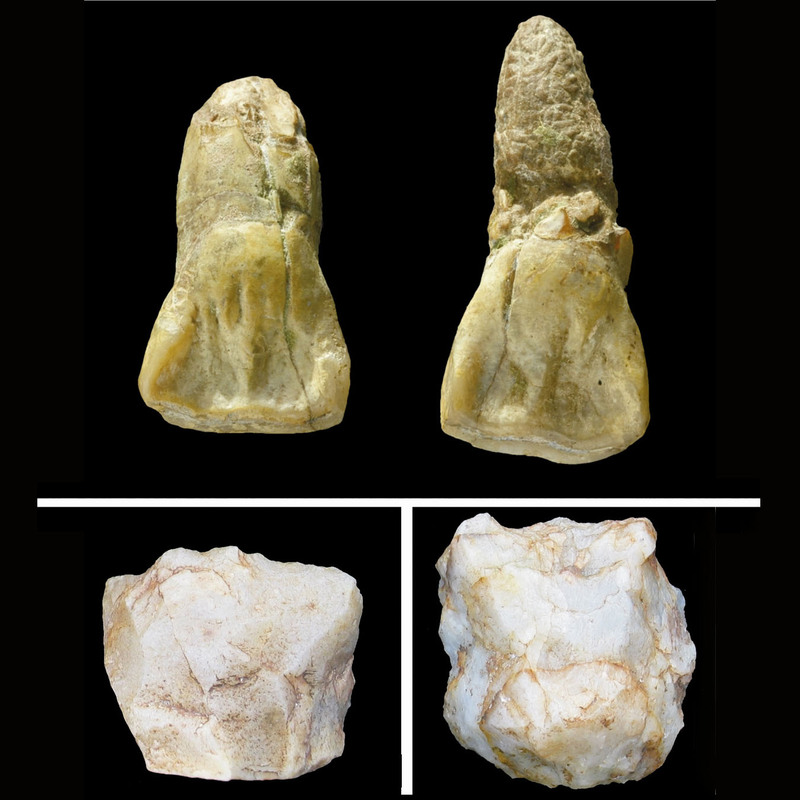 The oldest known evidence of hominins outside of Africa come from the site of Dmanisi in the Republic of Georgia, one of the most prolific fossil human sites in recent years. The age of the Dmanisi fossils is about 1.85 to 1.75 million years old. Comparing the Georgian and Chinese dates, the evidence from the Nihewan and Yuanmou regions is consistent with the spread of early hominin populations beyond Africa into the Caucasus region and into East Asia between roughly 2 million and 1.7 million years ago. By 1.66 million years ago, early humans of the genus Homo who reached eastern Asia were able to disperse over a wide area that extended from at least 40°N (Nihewan basin) to 7°S (Java, Indonesia), across a habitat range from temperate grassland to tropical woodland and possibly forest. Do these dates truly indicate the oldest hominin dispersal from Africa to East Asia? Further surveys and excavations in promising areas such as the Nihewan and sites in southern China are necessary to keep pursuing the answer to this question. The evidence point to Homo erectus as the first. In fact, the relatively longer legs of this species than in earlier hominins may also signal this is species was the first human ancestor capable of ranging over a wide geographic area. However, the oldest Indonesian fossils discovered so far are not complete enough to definitively assign to H. erectus. The Yuanmou teeth are not by themselves sufficient to say they represent H. erectus. Finally, the ‘hobbit’ H. floresiensis is an enigma as to whether its direct ancestor was H. erectus or an earlier species of the genus Homo. The case is still open, then, about which species was the first to reach East Asia. The dispersal to East Asia, nonetheless, culminated in the ability of hominins to adapt to a wide variety of environments and, eventually, H. erectus was able to persist in this part of the world for more than 1 million years prior to the arrival of H. sapiens. 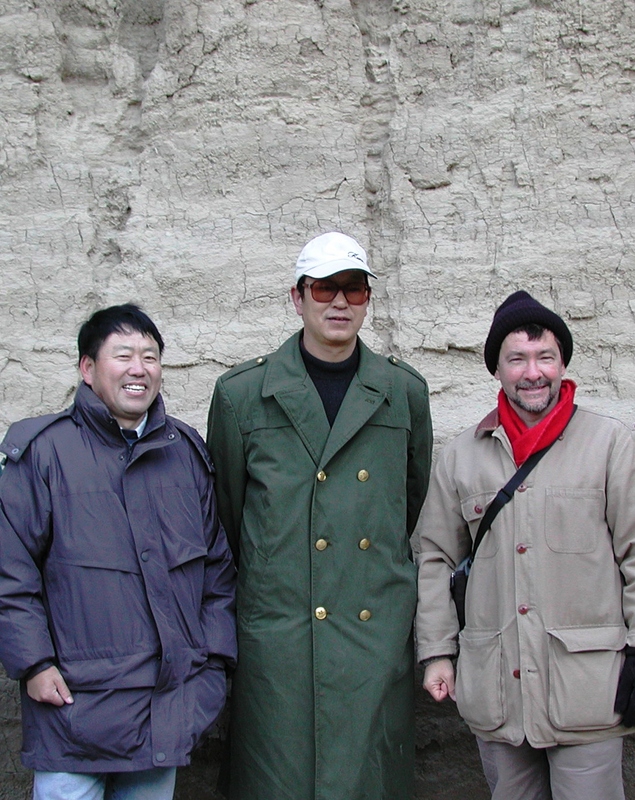 Dr. Zhu Rixiang, Prof. Xie Fei and Dr. Rick Potts. The Smithsonian’s Human Origins Program will continue to pursue these intriguing questions in collaboration with Chinese, Indonesian, and other researchers. The dating work in China is led by Dr. Zhu Rixiang of the Institute of Geology and Geophysics, Beijing. The paleoanthropological part of the project is led by Dr. Rick Potts. Excavations in the Nihewan basin are led by Prof. Xie Fei of the Hebei Province Institute of Cultural Relics, Shijiazhuang. Zhu R.X., Hoffman, K.A., Potts, R., Deng C.L., Pan Y.X., Guo B., Shi C.D., Guo G.T., Yuan B.Y., Hou Y.M., Huang W.W., 2001. Earliest presence of humans in northeast Asia. Nature 413, 413-417. Zhu, R., An, Z., Potts, R., Hoffman, K.A., 2003. Magnetostratigraphic dating of early humans in China. Earth Science Reviews 61, 341-359. Zhu, R., Potts, R., Xie, F., Hoffman, K.A., Deng, C.L., Shi, C.D., Pan, Y.X., Wang, H.Q., Shi, R.P., Wang, Y.C., Xhi, G.H., Wu, N.Q., 2004. New evidence regarding the earliest human presence at high northern latitudes in northeast Asia. Nature 431, 559-562. Zhu, R. X., Potts, R., Pan, Y.X., Lü, L.Q., Yao, H.T., Deng, C.L., Qin, J.F., 2008.. Paleomagnetism of the Yuanmou Basin near the southeastern margin of the Tibetan Plateau and its constraints on late Neogene sedimentation and tectonic rotation. Earth and Planetary Science Letters 272, 97-104. Zhu, R.X., Potts, R., Pan, Y.X.,Yao, H.T., Lü, L.Q., Zhao, X. Gao, X., Chen, L.W., Gao, F., Deng, C.L., 2008. Early evidence of the genus Homo in East Asia. Journal of Human Evolution 55, 1075-1085.